Professor Sue Black and colleagues in the Centre for Anatomy and Human Identification (CAHID) at the College of Life Sciences, Dundee – who feature in the new series of BBC2’s 'History Cold Case' - are building a new morgue which will allow them to adopt the Thiel method of embalming. This gives surgeons, dentists, students and medical researchers a more realistic method of testing techniques, practising procedures and developing new equipment and approaches. The University has committed £1 million to the project but another £1million needs to be raised. 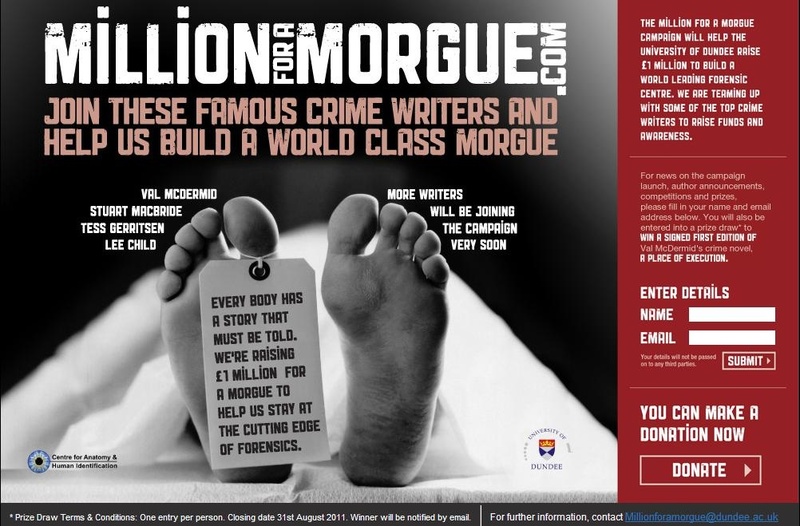 Bestselling author Val McDermid has been signing up her crime writing colleagues across the world to join the fundraising campaign, and first to confirm their support are Lee Child, Tess Gerritsen and Stuart MacBride. More will be announced in the coming weeks. The link-up between the morgue project and the crime writers has come about through the friendship between Val McDermid and Professor Black. “I’ve known Sue for years and she has helped me tremendously with a lot of the sort of grisly technical detail that goes into my books,” said Val. “When she told me about the project for the new mortuary I thought this was a chance for myself and other writers to give something back to a community that is of tremendous value to us. Professor Black is delighted to have the crime writers on board for her fundraising project. Professor Black and Val McDermid appeared together at the Borders Book Festival in Melrose this weekend, talking about their work together. Professor Black and other members of the CAHID team feature in the major BBC2 series 'History Cold Case', which showcases their expertise across the field of human identification. The second series of the programme begins on BBC2 on Thursday 23rd June with Episode 1: The Bodies in the Well. The CAHID team have developed groundbreaking techniques in areas such as hand identification, which has directly led to the successful prosecution of a number of paedophiles identified from images of their hands found in obscene photographs and films.